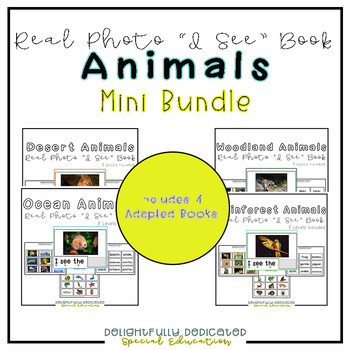 This mini bundle includes 4 real photo "I See" books about animals. Save $1 when you buy the mini bundle. Each book is differentiated for 3 levels of learners. Students can match real photo to real photo (identical matching), real photo to symbol (non-identical matching), and real photo to word.